Everything is not Easter this weekend. 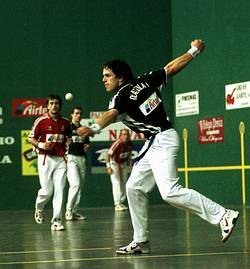 This Sunday there will be two simultaneous contests of Basque Pelota, one of the most popular and best known Basque sport. Picture by: La Voz de Galicia / A.A. In Mendizorrotza, in the outskirts of Vitoria-Gasteiz there will be the first semi-final with Olaizola II & Beroiz versus Titín III & Merino II. The winners will be practically classified for the final in 29th April. And in Pamplona there will be the fight of Berasaluze VIII & Albisu versus Xala & Laskurain to get the third place for the final.